The Rio Olympics 2016 hasn’t officially started yet, and already Digicel is taking no chances. They’re making sure to have every possible service ready to woo customer away from FLOW Jamaica, who are the exclusive Telecom sponsors and ho have already begun to kick things off with a JA$2500 Huawei Y360 sale as parlayed in JA$2500 Huawei Y360 on Friday is a Barrel of 99c and MVP Calling. 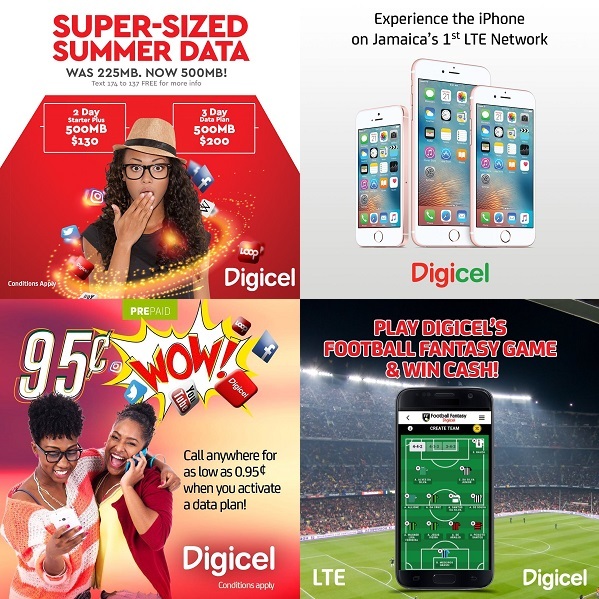 Digicel, still basking in the afterglow of the launch of Digicel LTE and their Digicel Play milestone of 35,000 customers as reported in Digicel Play has 35,000 customers as FLOW Jamaica Horizon fails to impress, are cranking up the Marketing Machinery! This time, it’s in the form of a series of promotions to counteract FLOW Jamaica’s continue celebration of reacting their 1 millionth customer milestone as I’d declared in How Flow Jamaica celebrated 1 million customers with a 99 cents FAM Plan. So what is Digicel doing? Activating the Digicel LTE on your smartphone is easy as explained in How to Activate a Digicel LTE Smart Plan on your Smartphone. They’re even selling the 4″ Apple iPhone SE, an indication that FLOW’s exclusive hold on the Apple iPhone has been broken as of Wednesday July 7th 2016 as per their post on their @DIGICELjamaica Twitter feed. And yesterday on Friday July 29th 2016 they also threw in a Fantasy Football Game that can net you JA$14000 if you win. WIN weekly cash of $14,000 in Digicel's Football Fantasy game. So what about the 4G customers! The 2 Day Starter Plus that costs J$130 and gives you 225MB as well as the 3 Day Data Plan that costs JA$200 and gives you 250MB have both been upgraded to 500MB. As usual, Text 174 to 137 FREE for details. But Digicel didn’t stop there. In direct counteraction to FLOW Jamaica’s 99c Plan once you activate a 30 Day Data Plan as detailed in FLOW Jamaica’s 30-Day Prepaid Mobile Internet gives you 99 cents Plan, they decided to create their own version. 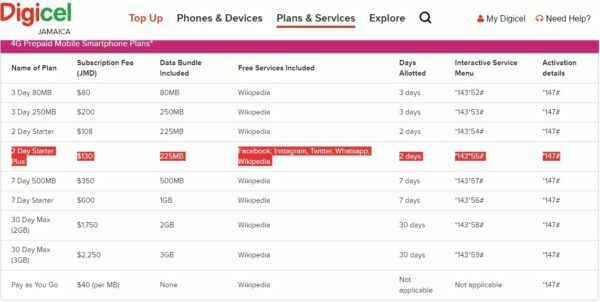 Their also has a catch as well; you have to activate a 3-Day Data: Plan using the MyDigicel App to get 95c per minute calling. And yes, you can text 95 to 137 for more details.